Here's my card for this weeks Penny Black Saturday Challenge Week 61 which is based on a sketch. I had to re size mine down as our standard card size is smaller but hope it still fits the challenge. 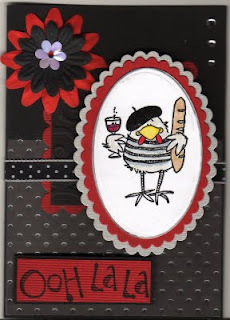 Thought I would have a change from cat's this week and decided you use my cheeky French hen, it took ages to decide upon the right colour combinations but pleased with the results. The sentiment just fits nicely. Hiya Cynthia - Thank you for your comments. It is much appreciated. This looks really sparky - I have this but have not used it yet, as the case with quite a new stamps I'm afraid. I used to have a persian like yours - Foxy - but he died at the ripe old age of 18 just two years ago, and two weeks later I lost the brother to the one I have left (out of five). She is a very fiesty pewter persian. However, at the end of September I am having a couple of chincillas (white), and hopefully a golden chincilla in November. I found it quite daunting setting up a blog - I don't know why - but it is great that somebody else gets so see what I am doing, and it spurs me on. Oh I love this stamp, I keep meaning to get it! Great card with it too, I love the colour scheme! Thanks for playing along with my PB sketch this week! GORGEOUS! I love the colours you've used and that hen is FAB!